Francisco Buarque de Hollanda (born June 19, 1944 in Rio de Janeiro, Brazil), popularly known as Chico Buarque, is a singer, guitarist, composer, dramatist, writer and poet. He is best known for his music, which often includes social, economic and cultural commentary on Brazil and Rio de Janeiro in particular. Son of the academic Sérgio Buarque de Hollanda, Buarque lived in several locations throughout his childhood, though mostly in Rio de Janeiro, São Paulo and Italy. He wrote and studied literature as a child and came to music through the bossa nova compositions of João Gilberto. He performed music throughout the 1960s as well as writing a play that was deemed dangerous by the Brazilian military dictatorship of the time. Buarque, along with several of his fellow musicians, were threatened by the government and eventually left Brazil in 1970. He moved to Italy again. 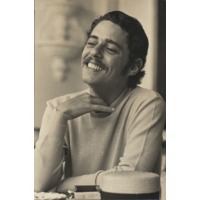 However, he came back to Brazil in 1971, one year before the others, and continued to record albums, perform, and write, though much of his material was not allowed by government censors. He released several more albums in the 1980s and published three novels in the 1990s and 2000s, all of which were acclaimed critically.